I continued east on US 12. It parallels the Musselshell River between Checkerboard, MT, and Melstone, MT. 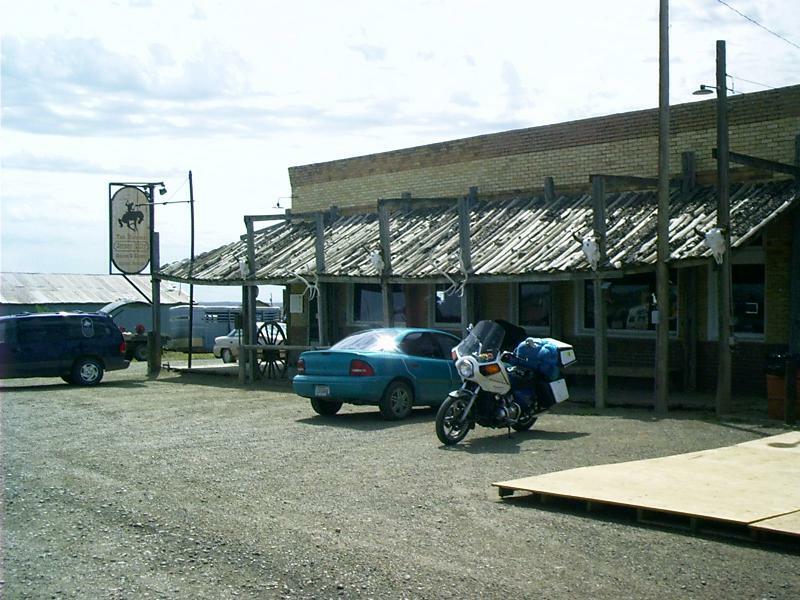 Then it crosses badlands to Forsyth, MT, and follows the Yellowstone River to Miles City, MT. These are southern tributaries of the Missouri River. From Forsyth, MT, to Eau Claire, WI, US 12 follows the Yellowstone Trail laid out by a trail-booster association in the days of named highways. A 56-mile section of highway over Marias Pass was the last section of the Theodore Roosevelt International Highway to be completed. Prior to the completion of this section in 1930, automobiles were loaded onto railcars and transported from one side of the pass to the other. The Theodore Roosevelt International Highway extends 4.060 miles from Portland Maine, to Portland, Oregon, by way of Ontario, Canada. Now, this was strange to me because I had never heard of the Theodore Roosevelt International Highway. As it turns out, there was such a designation. By the mid 1920's, trail associations had named over 250 routes. They included transcontinental routes, such as the Dixie Overland Highway (Savannah, Georgia, to San Diego), the Lee Highway (Washington, D.C., to San Diego), the Old Spanish Trail (St. Augustine, Florida, to San Diego), the Pikes Peak Ocean to Ocean Highway (New York City to Los Angeles), the Theodore Roosevelt International Highway (Portland, Maine, to Portland, Oregon, with a Canadian stretch through Ontario), and the Yellowstone Trail (Boston to Seattle). Also, there was the Grand Army of the Republic (GAR) Memorial Highway (US 6), which was known as the Roosevelt Memorial Highway in the 1930s, but there was no connection with the Theodore Roosevelt International Highway -- geographic or otherwise. The same must be said for the National Roosevelt Midland Trail, which was utterly dismembered to establish the numbered highway system. 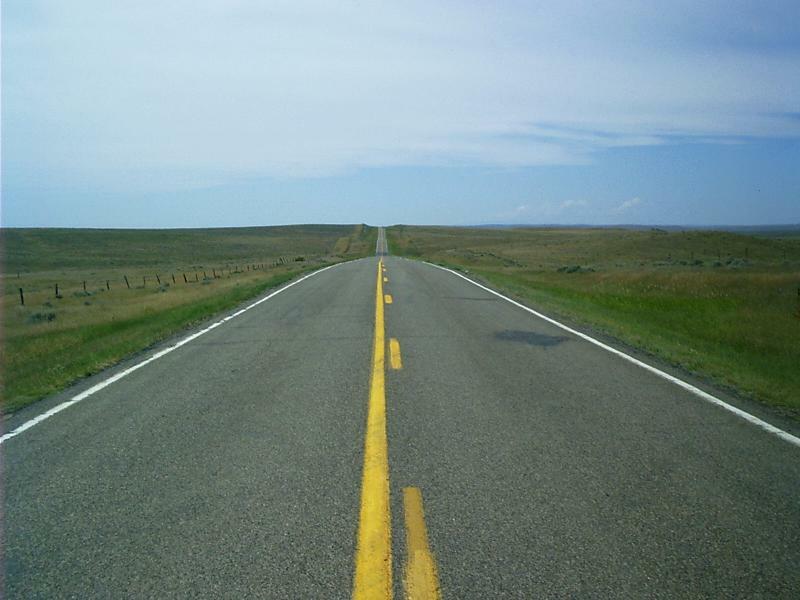 Before there were numbered highways in the US, there were named highways such as the National Road (US 40), the Lincoln Highway (US 30), and even the Yellowstone Trail (US 12). These were planned and named by interstate booster associations. The associations mostly folded in the Great Depression when their trail designations were made obsolete by the numbered highway system; nevertheless, in places, several manage to eke out a marginal existence. You can find a wealth of material about them on the Internet. The alignments of the old named routes changed from year to year. The numbered routes, which superseded them, were not intended to owe any allegiance to the old named routes. The numbered routes were generally more direct than the named routes and were only approximately congruent with them. 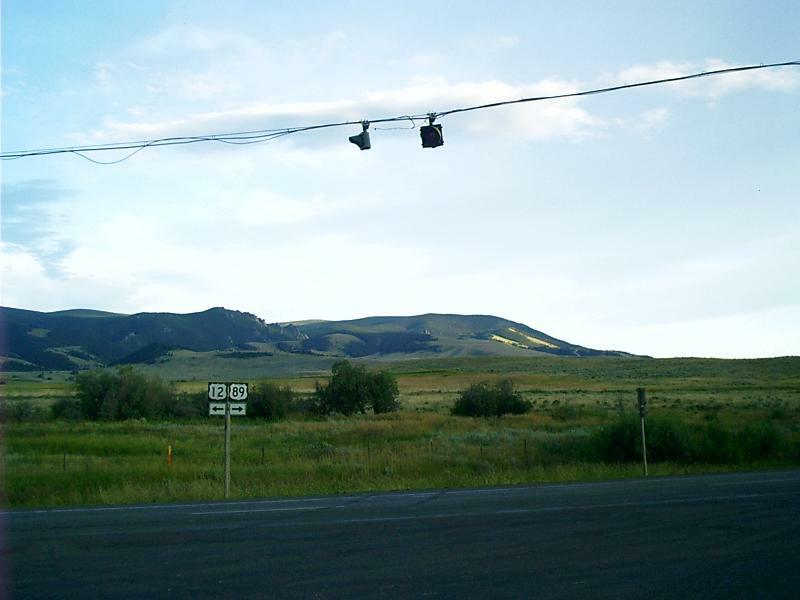 I have heard US 2 referred to as the Hi-Line in the same way that I have heard old US 66 called the Mother Road, but these nicknames came after the numbering system. With the advent of the interstates, old US 66 was decommissioned entirely (possibly as a delayed reaction to the rancor of its inception) and replaced by a series of interstate routes. I 70 supplanted US 40, I 80 took the place of US 30, and I 94 and I 90 absorbed traffic from northerly east-west routes such as US 2 and US 12. The route east lacks rain in the shadow cast by the Rocky Mountains along the Continental Divide to the west. On the upper Musselshell, some source of water seems to nourish cottonwoods in the creek bottoms. Perhaps there are springs. 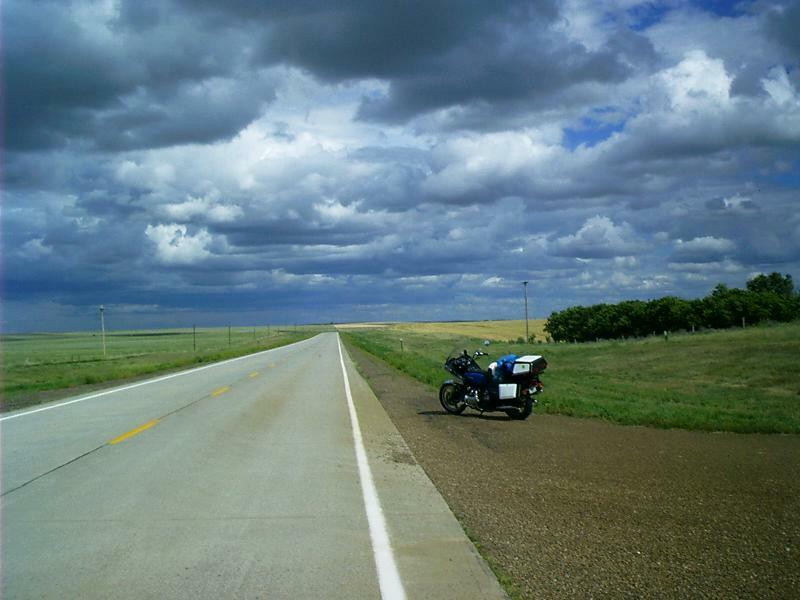 Things are dry for a good ways on either side of Miles City, MT. You don't really see row crops until after you cross the Missouri River itself in the middle of South Dakota at Mobridge. In the 1880s, days of the open range, many a roundup outfit worked this country. The spring roundup gathered the cattle in order to brand and tally the calf crop. The fall roundup gathered beef critters for shipping. An outfit consisted of the captain, the riders, the "reps" from neighboring ranges, the cavvy or horse herd in charge of the day herder and night hawk, the four horse chuck wagon piloted by the cook and the bed wagon driven by his flunky. Camp moved each day. The cowboys rode circle in the morning, combing the breaks and coulees for cattle and heading them toward the central point to form a herd. In the afternoons of spring roundup the guards kept the herd together, the cutters split out the cows with calves, the ropers dabbed their loops on the calves, took a couple of dally welts around the saddle horn and dragged 'em to the fire. There the calf wrestlers flanked and flopped them, and the brander decorated them with ear notches, or dew laps, and a hot iron. It wasn't all sunshine and roses. ... you will discover it to be a beehive of activity and the hub of society for miles around -- not your wimpy Midwestern miles either but honest to God Montana miles -- and I must point out as well that they do serve Moose Drool. Ingomar has no paved streets and reposes upon the open range. You have to cross cattle grates on either side of the rail grade, getting into town from the highway. What attracted my attention was their roadside marker, which quoted a few stanzas from the Ingomar brochure. The reason for the extended stay was to regain confidence in the mechanical worthiness of my motorcycle. The voltmeter on the dashboard indicated that the battery wasn't charging, coming into Forsyth, MT. I ordered a new voltage regulator, waited until it arrived, and installed it before riding the bike. Then I fiddled with the electrical wiring for a couple of days, trying to make the voltmeter work. Cleaning some contacts ultimately turned the trick. 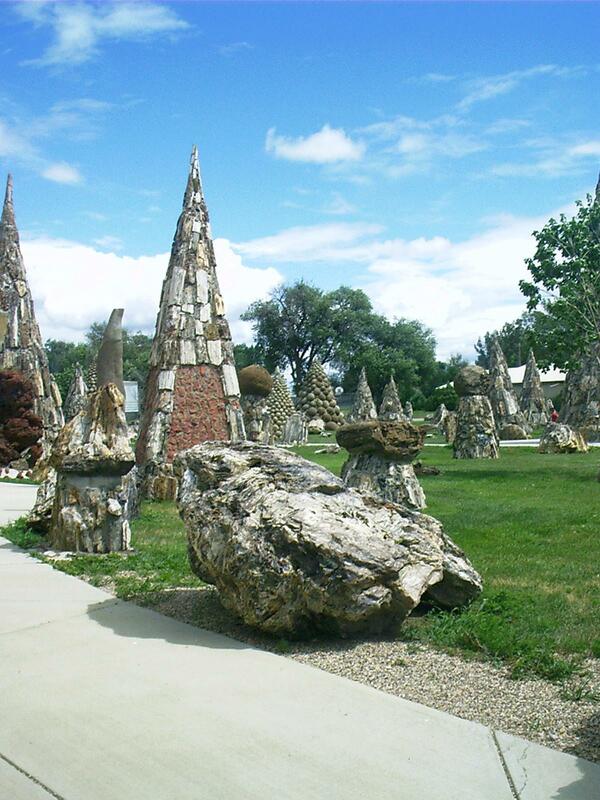 Finally one comes to the Petrified Wood Park in Lemmon, SD. What can one say? Here were collected tons of stones from the surrounding landscape as though the city's boosters had hoped to corner the market. Here the rubble was glued to the outside surfaces of a whole city block-full of cement obelisks, a museum, and a gas station in a technique which might as well be named paleontological appliqué. Here it is -- the nub, the nut, the moral of the story I've been telling: The more things change -- the more they stay the same. One sees a lot of motorhomes the size of Greyhound buses coming down the road, but one notices a lot more sitting in campgrounds. With fuel tanks in excess of 100 gallons and ranges approaching a thousand miles, these behemoths, like the old-time passenger trains, are built to travel the long haul. In the heyday of railroads, the idle (rich or not) lavished weeks on their tour of Glacier Park by horseback. It's not so different for an RV owner to round up partners, cart them all off to one well known, scenic destination, and spend a large portion of the season there. That's not the way it is with automobile touring! You need food, fuel, and a place to sleep because you can't take it with you like a railroad -- like a motorhome rolling down the interstate. It's more like piloting a steamboat up a river. You have to tie up every once in while to chop firewood, to duck windy weather, and to wait out the dark. You're a lot more dependent on the path you have to take. Roadside attractions are the tinkling echoes of times gone by. The modern traveler doesn't apprehend the need. His trip is only about where he's bound. It's not about the territory he hurries through. Still, those of us journeying more lightly on the land can stop to see something before the emptiness swallows it. 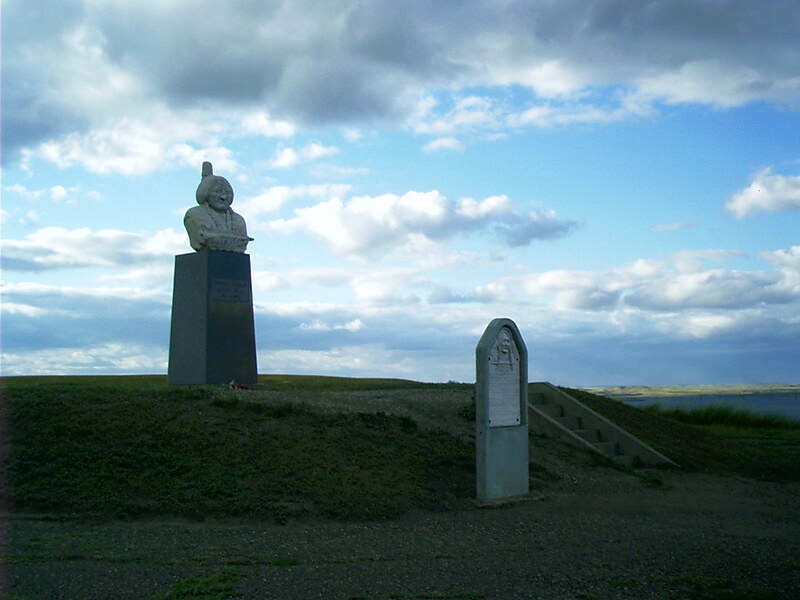 Sacagawea (Sacajawea, Sakakawea), the Shoshone interpreter of the Lewis and Clark Expedition, is presumed to have been buried at Fort Manuel, which is now mostly inundated by Lake Oahe. This is her memorial. At the same site as the Sacagawea Memorial on a bluff overlooking the Oahe Reservoir on the Missouri River at Mobridge, SD, is the final resting place of Sitting Bull. He was not buried here initially. The bust is by the late American sculptor Korczak Ziolkowski who is best known for his design and early work on the Crazy Horse Memorial near Custer, SD. The portrait on the nearby marker is unattributed. Sitting Bull was born on the Grand River a few miles west of Mobridge. His tragic end came at the very place he was born. He was shot when being arrested because of his alleged involvement with the Ghost Dance Craze. Sitting Bull was originally buried at Fort Yates, ND. On April 8, 1953 surviving relatives with the aid of the Dakota Memorial Association moved his remains to the present location and dedicated the Memorial Burial Site April 11, 1953. 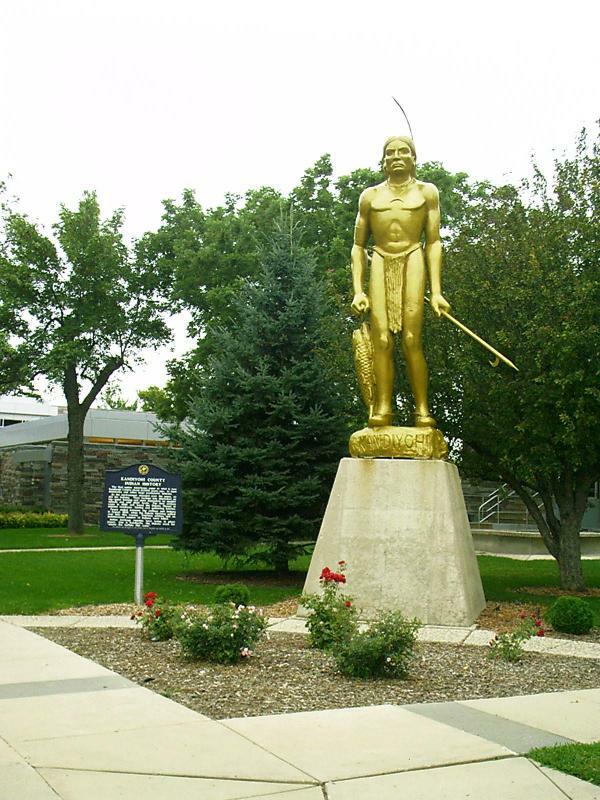 This Indian image first became part of Willmar in 1915, when it appeared as the Kandiyohi County Bank symbol. That same year, artist Eben E. Lawson, commissioned by the bank, created "Kandiyohi," a smaller sculpture which was the basis for this larger statue. In 1929, "Chief Kandiyohi" (a nickname the Indian symbol received, although there never really was a chief by that name) found a home with the Bank of Willmar following several bank mergers. Bank of Willmar President Norman Tallakson contracted to have the 17-foot statue made in 1956. It was mounted on the bank overlooking Litchfield Avenue for 27 years. On July 25, 1983, the statue was moved to this site, after it was donated to the City of Willmar and Kandiyohi County by First American Bank and Trust of Willmar. * "Where the Buffalo Fish Come"
Willmar, MN, is the county seat of Kandiyohi County. The biggest ball of twine defies description. 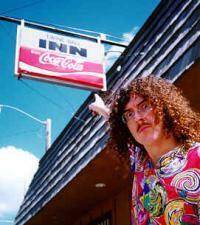 That hasn't stopped "Weird Al" Yankovick from immortalizing The Biggest Ball of Twine in Minnesota in song. I was back in Wisconsin. 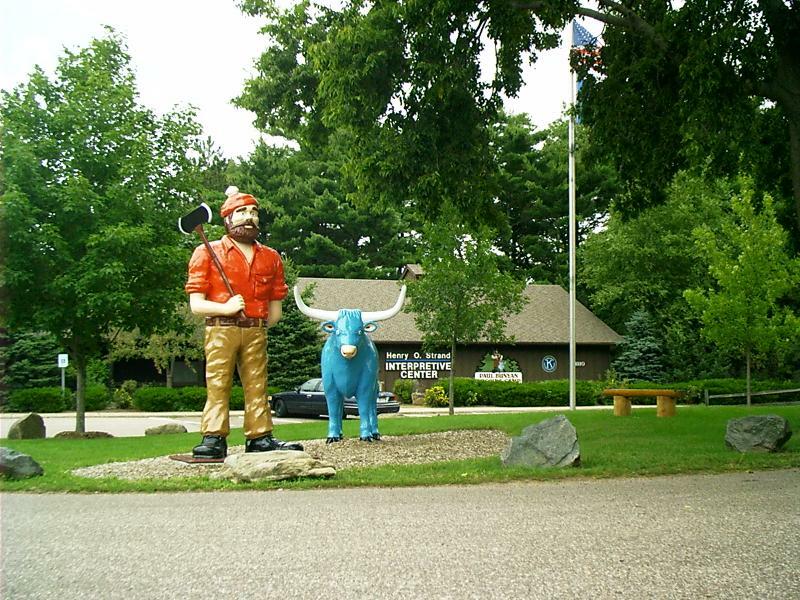 "Miniatures" of legendary lumberjack Paul Bunyan and Babe the Blue Ox grace the entrance to a logging camp reconstructed from artifacts of the 1890s. A nearby museum houses displays of local history. Expect to spend several hours reading the extensive and detailed exhibit notes. There is an audacious attempt cogently to convey geographic movement of Indian tribes from traditionally assumed prehistoric origins through the historic diaspora in advance of European invasion to their present-day reservation holdings. This is difficult to do without descending to granularity of bands within tribes. That exhibit focuses on Ojibwa and neighboring tribes to show how they hopscotched one another throughout the Midwest much like the Slavic Tribes before the Mongol Hordes in central Asia. It started sprinkling just as I was setting up my tent and never really let up that night. The next morning, it still showed no overt signs of stopping. I had passed my last night away from home, so I folded my tent wet and went on my way. From here, I followed WI 29 east to Green Bay, leaving the Yellowstone Trail at Abbotsford, WI, where it turned south to US 10 near Marshfield, WI. 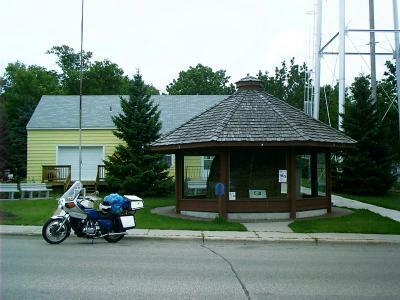 This spot in Section 14, in the Town of Rietbrock, Marathon County is the exact center of the northern half of the Western Hemisphere. 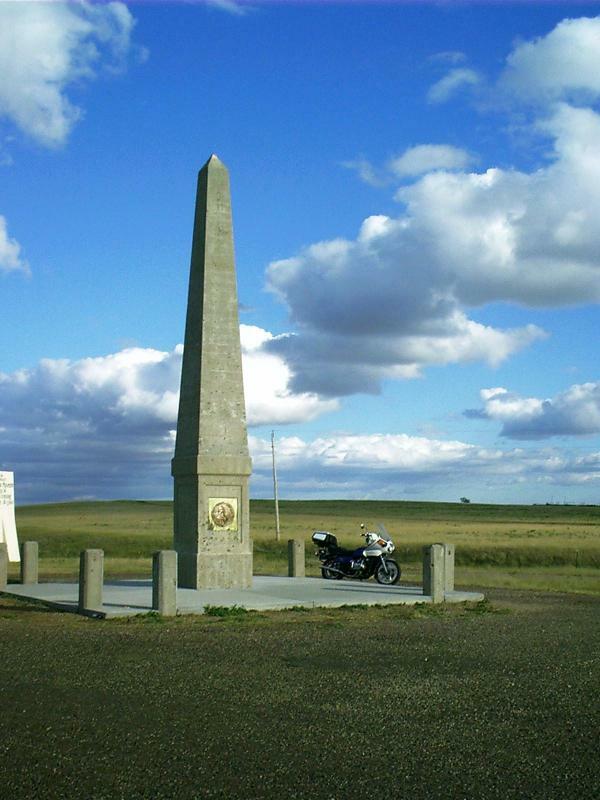 It is here that the 90th meridian of longtitude (sic) bisects the 45th parallel of latitude, meaning it is exactly halfway between the North Pole and the Equator, and is a quarter of the way around the earth from Greenwich, England. Poniatowski is one of those rare Polish names with a superabundance of vowels. I have it on good authority that you don't need them all. Instead, you say the name Pon-uh-TUSK-y. A buddy of mine lives in Wausau, WI, (44º 55' 31" N 089º 37' 52" W, elevation 1210 ft, population 38 thousand) just minutes away from Poniatowski. He says they are mistaken who maintain that Wausau is in the middle of nowhere when, in fact, it's at the middle of everywhere. Well, that wraps it up. 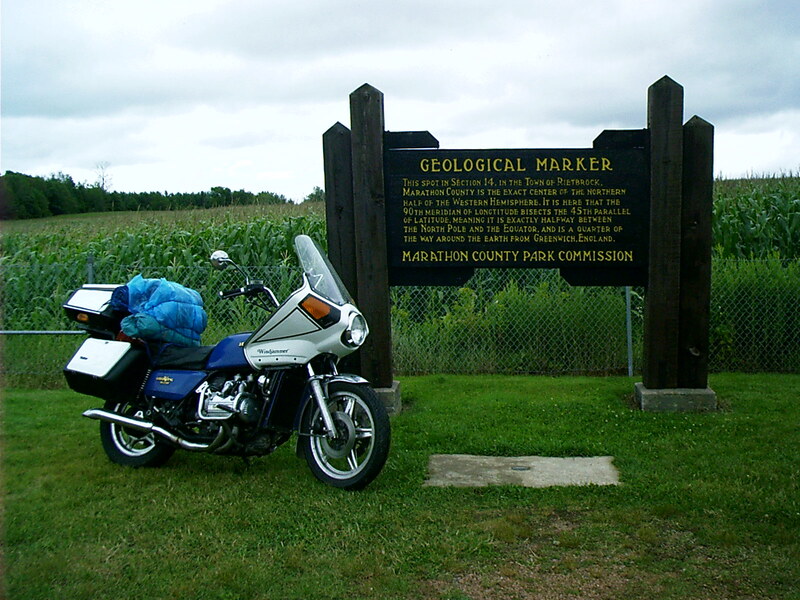 I stayed on WI 29 into Green Bay about 1-1/2 hours away, closing the loop of my grand western motorcycle excursion on 11 AUG where I started from on 25 JUL 2004. Rhode, Chuck. "Down the Yellowstone Trail." The Hi-Line and the Yellowstone Trail: To Glacier Park and Back Again. 1 Sept. 2004. Lacus Veris. 24 Apr. 2019 <http://lacusveris.com/The Hi-Line and the Yellowstone Trail/The Wide Missouri/The Yellowstone Trail.shtml>. Last modified 6 Oct. 2015. Served 12465 times between 16 May. 2010 and 24 Apr. 2019. Contact mailto:CRhode@LacusVeris.com?subject=LacusVeris.